Today we’ll be taking a look at Sakura Arms (桜降る代に決闘を), a two player card game I picked up at a previous Tokyo Game Market. 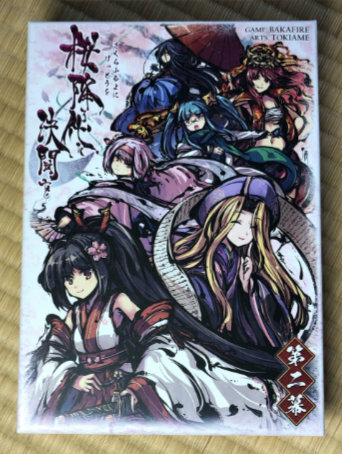 There is now a new edition and apparently a digital edition as well, but we’ll be taking a look at the previous version, which is also the base for the English version of the game. Coming in a sturdy box, the first thing that stands out is the beautiful artwork. The artist Tokiame has developed quite the following with signing events at Tokyo Game Market always having long lines. Game play is estimated to take ten to twenty minutes, including deck building. When I played with a friend, our games took a bit longer as we were still learning the rules, but even so, finished quickly. 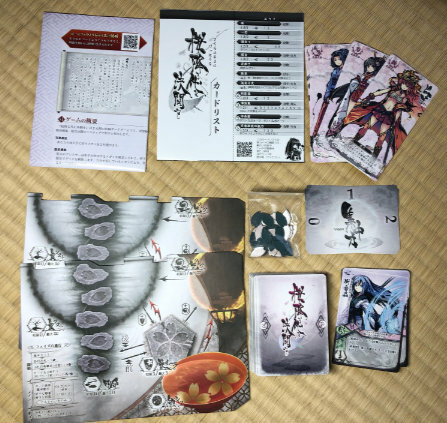 Included in the box are 80 cards, 7 goddess (“megami” 女神 cards), two interlocking boards, cherry blossom petal counters, a short rulebook and card list. 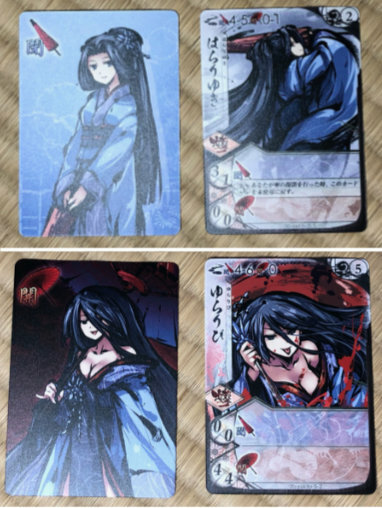 The cards themselves have a high quality feel to them and are quite beautiful. The goddess cards are narrow, tarot style cards and represent the character you play as. Each has a distinctive style of play, some favoring offense and other defense. There are goddesses (megami) that live among humans. Some humans, called Mikoto, can call upon two goddesses to aid them in their duels. 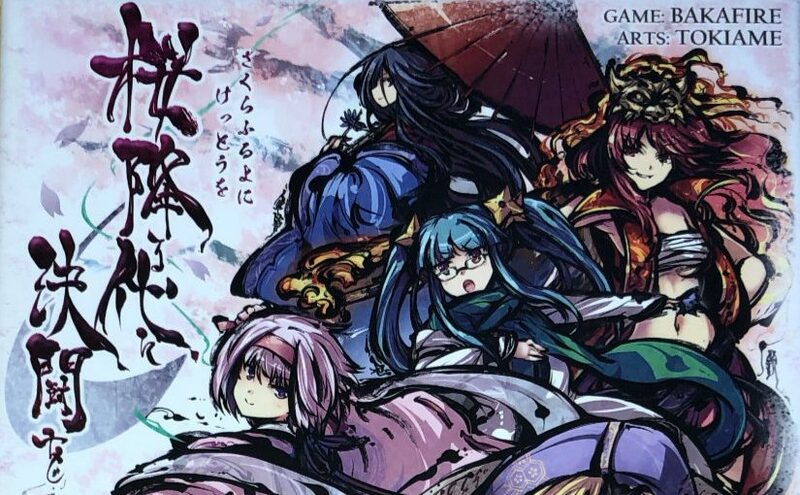 The players take on the roles of these Mikoto. Sakura (cherry blossom) crystals are embedded in their hands and are used to channel the goddesses. 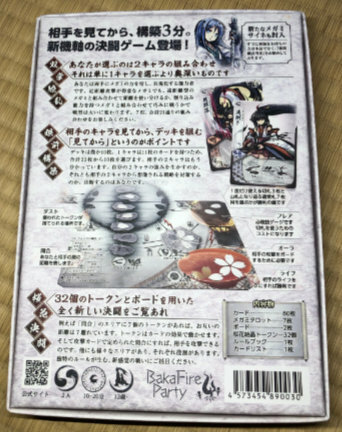 Sakura are used to power various abilities as well as represent the player’s life, moving between different pools. 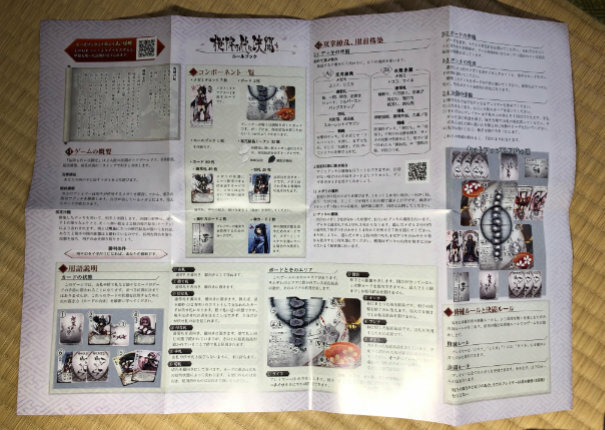 The rules are available online in both English and Japanese from the publisher sites. The Japanese rules themselves are short, fitting on a two sided A3 paper. The game provides recommended goddess and deck combinations for beginners, so my friend and I played with those. 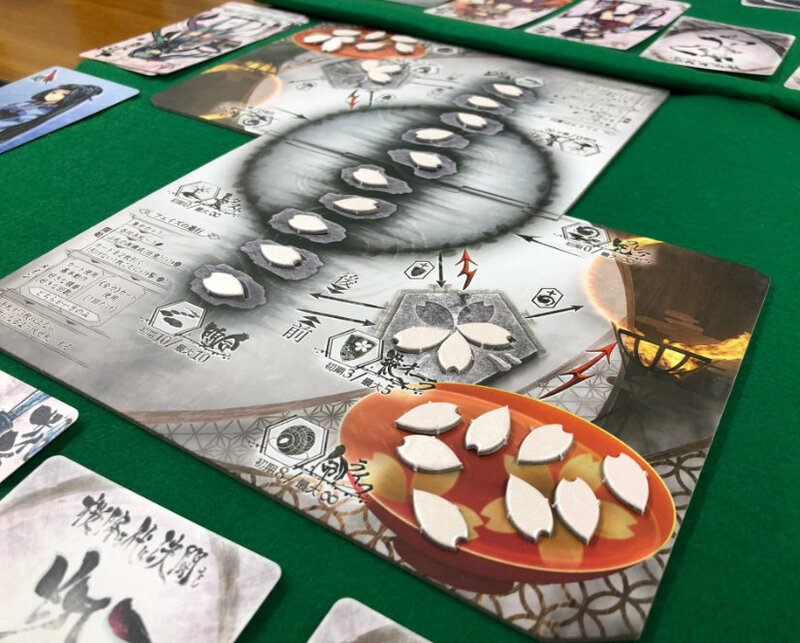 The only token type in this game is a cherry blossom petal, but its meaning changes based on its position on the board. I enjoyed the interplay of cherry blossom tokens as they move between the various resources: Flare, Aura, Life, Range, and Dust. Flare is used to pay for special powers, while Aura is used to attack the enemy. When a player’s life becomes 0, they lose the game. Range is the distance between you and your opponent, and determines which abilities can be used. Finally, Dust is the castoff petals that have been used. The movement between each resource is listed on the board, as well as each limit. For example, Aura starts at three and can be a max of five. Being a dueling game, you win when your opponent’s life becomes 0. Each player chooses two goddesses. 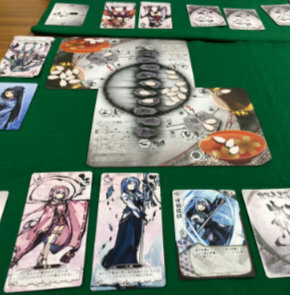 After showing their opponent which goddesses you chose, each player then builds a deck. Once the decks are built and the boards are setup, play begins. One goddess actually has two aspects- a demure woman when her umbrella is closed and a crazed killer when it is open. 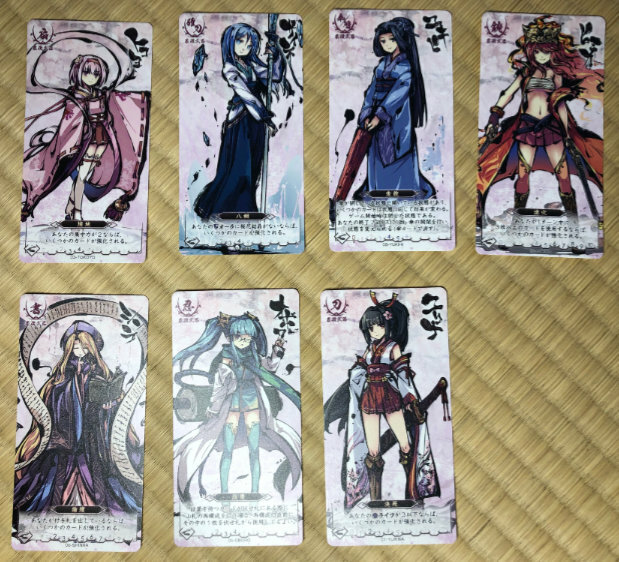 Each goddess has a set of cards they can use, each with seven normal and four special cards. Players build a deck of exactly seven normal cards and three special cards, for a total of ten. Cards are classified as Attack, Action, and Enhancement, with some having a subtype, such as as “reaction.” Attack cards also have a range and damage, while Enhancement cards have a Charge, which indicates the number of tokens that are placed on it. Certain special cards have a cost that must be payed in Flare. Once decks have been constructed, each player draws three cards and play begins. Upkeep for each turn consists of gaining one Vigor, Enhancements losing one token, optionally reshuffling your deck, and then drawing two cards. You can choose to reshuffle your remaining deck, discard, and played card piles to make a new deck, but doing so costs one life. After that the main portion of the turn begins and you can play any number of normal actions or a Throughout action once. Once actions have been resolved, you must discard down to two or fewer cards. Attacks have a range they can be performed, the amount of damage they do, and optionally special effects. When an attack card is played, your opponent can play up to one reaction card. Enhancements can provide effects with three different timings: Initialization, Ongoing, and Disenchant. As expected, Initialization happens when you first played, Ongoing is applied while there are still Sakura tokens on the card, and finally Disenchant happens when there are no longer tokens on the card. The rules are overall relatively easy to read, but my friend and I did have some confusion over a couple of aspects that took several re-readings of the relevant section to figure out. The vocabulary is fairly standard, with a few flavorful words thrown in here and there, but once of the nice things about game rules is the consistent and precise usage of the same words. Most text uses a standard font that is easy to read, but the flavor text tends to use a stylized cursive style font that can be a bit hard to read. When there are no cherry blossom crystals (tokens) on an Enhancement card, that card is moved to the discard pile (used if a special ability). Also, if it has a Disenchant effect, that effect is resolved.